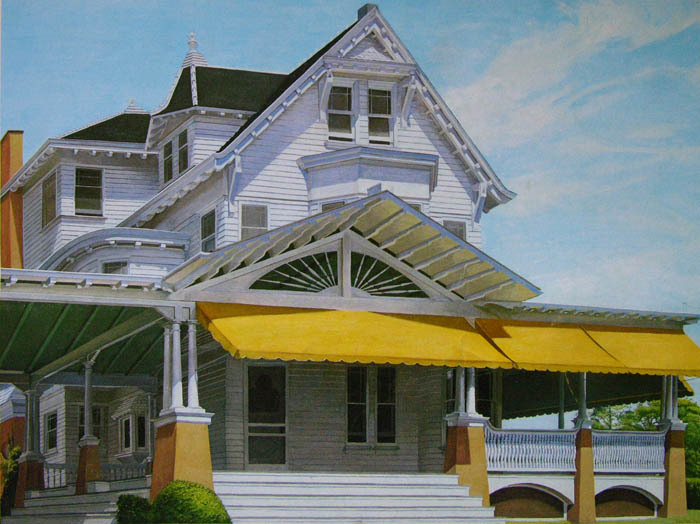 Yellow Awnings, Spring Lake, New Jersey, 1979, oil on canvas, 22 x 30 inches. I am heading down to the New Jersey shore to visit family for a few days, and maybe get to splash in the ocean. My childhood summers were spent there, in Bradley Beach, and I have many fond memories of them. 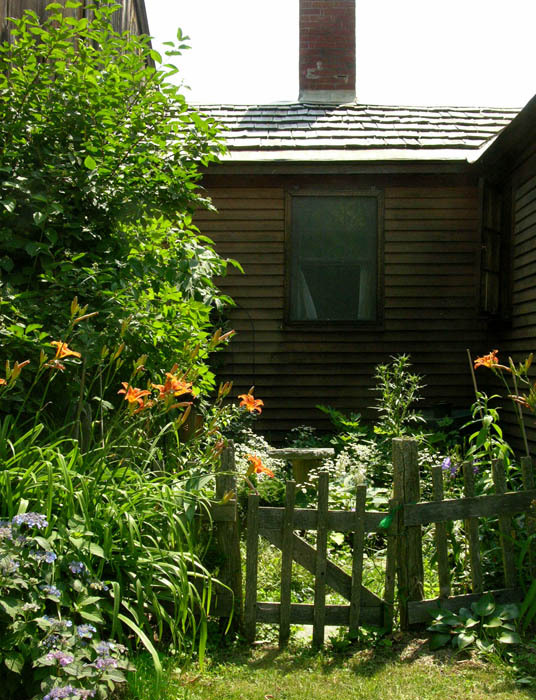 Early in my painting life I spent a summer painting the wood frame houses so abundant there. They are an emblem of a certain kind of life: lunches on the porch, bare sandy feet, outdoor showers, sunburn before we knew what SPF was. I'm hoping to say more about nostalgia as an artistic motivation...but not until next week. See you then. 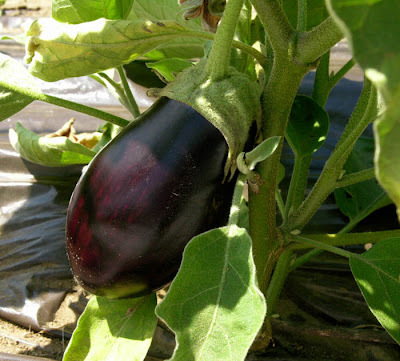 I love eggplant, so plant several varieties in my garden. 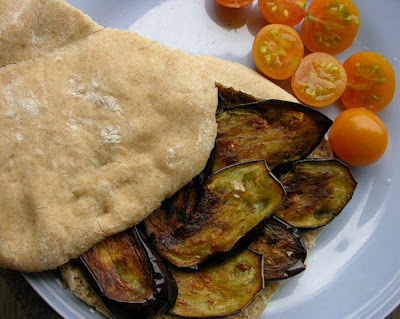 I like it roasted in a middle eastern salad – see the family recipe here – stir fried, or sliced and fried. I freeze the fried slices on layers of waxed paper placed in a box, which can then be used all winter for pasta sauces and eggplant parmesan. My favorite indulgence during summer is a fried eggplant sandwich, a meal that was a favorite when I was growing up. When I eat it now, I'm thinking that I'm basically eating some fiber with a lot of olive oil, but oh how delicious! Place in a bowl and sprinkle with salt; let stand for 1/2 hour. This draws out the moisture so the eggplant doesn't absorb as much oil. Before frying, blot the eggplant with paper towels. 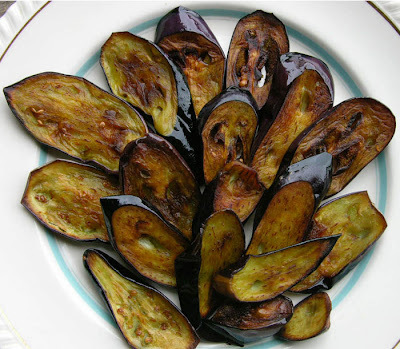 On high heat, bring about 1/4 inch of extra virgin olive oil (I think good oil is essential for this recipe) to a point where it sizzles if a piece of eggplant is placed in it. Fit the eggplant slices loosely in the pan. Fry until golden brown on one side, then turn and fry the other side. When done, place on a platter lined with paper towels to blot the extra oil. My mother always saves the extra oil from frying eggplant in a glass jar and re-uses it several times, so I do too. Because eating fried eggplant on what we called Syrian bread was traditional in my Syrian-Jewish family, that's how I prefer to eat it now. But I can't get good bread here in rural Vermont, so I make my own. My recipe is a combination of one from Claudia Roden's Mediterranean Cookery , whose ingredient list I use, and Bread Alone by Daniel Leader, whose cooking method I use. It's quite simple, but you must have a baking stone or quarry tiles for lining the oven rack. Put the flour in a mixing bowl with salt and a tablespoon of oil. Knead for about 15 minutes until elastic and smooth. If using the food processor, knead for a few minutes by hand. Place the dough in a slightly oiled bowl, cover with plastic wrap and leave in a warm spot to rise until doubled, two to three hours. When ready, knead briefly on a floured board and cut into 10 equal pieces. (I use my kitchen scale for this step.) Shape each piece into a tight ball and allow to rise, covered with plastic wrap, for 1/2 hour. Meanwhile, preheat oven to 400º for at least 1/2 hour, with a baking stone or quarry tiles (I use 6 tiles) placed in the center of the oven. Roll out each ball of dough into a flat round about 5 inches in diameter. Put 3 or 4 at a time onto the stone in the preheated oven. Bake for 4 minutes, during which time the bread will puff up and make a pocket. My breads don't come out perfectly; many times the top layer is too thin. But the combination of whole wheat and white flour is delicious and the bread is fresh, which is more than can be said for supermarket pita. It also freezes very well. It's worth giving it a try if you enjoy making bread. 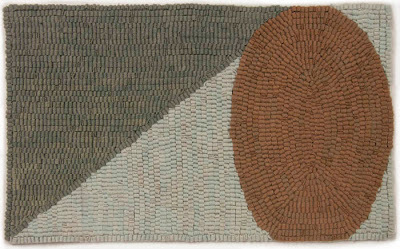 2011 #27, hand dyed wool and egg tempera on linen, 17 3/4 x 10 1/2 inches. I always look forward to working on these "drawings" on linen, in between my more complicated hooked projects. There is a lightness and humor to them, a feeling of experiment, that I enjoy. 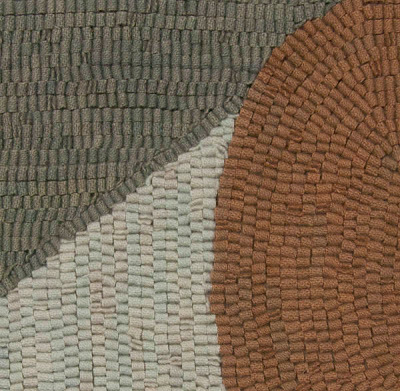 When I'm in the middle of a new batch, I think of only working on them and abandoning my other textiles, but then I look at the saturated color and texture of those works and realize that each body of work has its rewarding qualities. In #27 above, I was thinking of a narrow hanging scroll format, so cut the linen fairly close on the right. I wanted to give a sense of the rectangle almost leaning on the edge, just as the curling lines rest on the rectangle's right edge. After I cut the linen I thought that perhaps it was cropped too close, but I'm getting used to it. 2011 #28, hand dyed wool and egg tempera on linen, 13 1/2 x 13 inches. 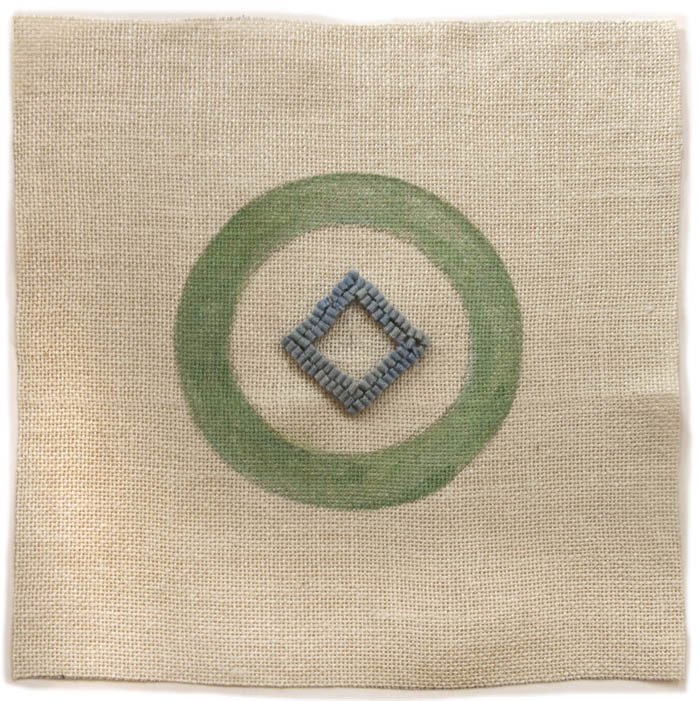 This piece was inspired by Kenneth Noland concentric circle paintings, though I made the central circle into a square. My original idea was to have the square entirely filled in will color, but after I had hooked two rows I felt it was right for the composition, so left it at that. 2011 #29, hand dyed wool and egg tempera on linen, 14 x 11 inches. All the drawings I've done thus far have had a composition centered on the linen field. I got an interesting suggestion from my artist friend (rappel): why not have empty centers? This question got me thinking about new ways of using the surface of the linen; having lines and shapes close to the edges creates different kinds of tensions. 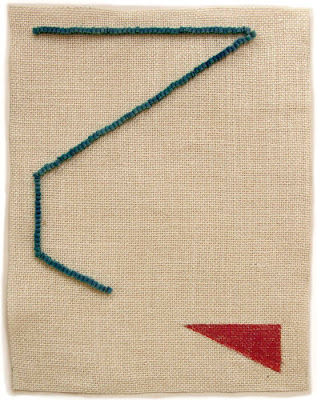 In my first two attempts I have a painted shape at bottom right; in #29 there's an expanse between the linear and painted shape, which I hope is filled with some "pull" between them; in #30 a zigzag leads to the red triangle. So, do you think this may be a fruitful compositional direction? 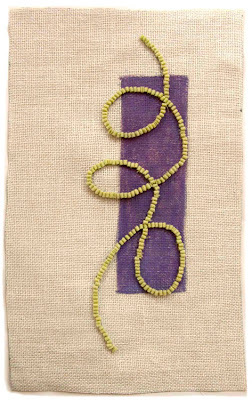 2011 #30, hand dyed wool and egg tempera on linen, 14 x 11 inches. as are wheat, rye, oats, rice, barley. It is difficult to look at a large field of tall growing corn and relate it to the grasses we see growing around us. It appears that the origins of agriculture date back to around 10,000 BCE or before, when wild grasses began to be cultivated. 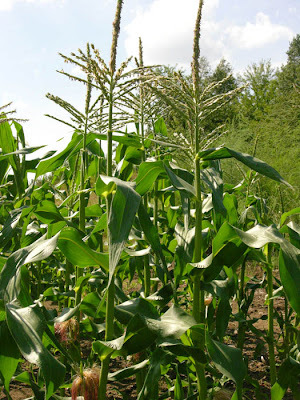 Corn, or maize, is a new world crop from Mesoamerica , and its domestication may have begun as long as 7,500-12,000 years ago. 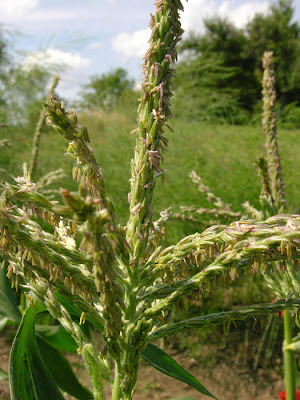 One of the theories of its beginnings has it coming from teosinte, a small annual grass, or a mixture of teosinte and wild maize. 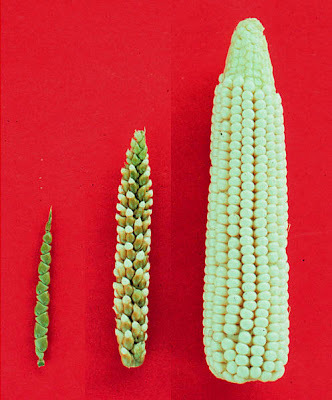 A few years ago I read a book on the beginnings of agriculture by Bruce Smith, and I remember being so surprised at seeing the tiny size of the wild ear of corn, which like other grains was selected over centuries for larger size. 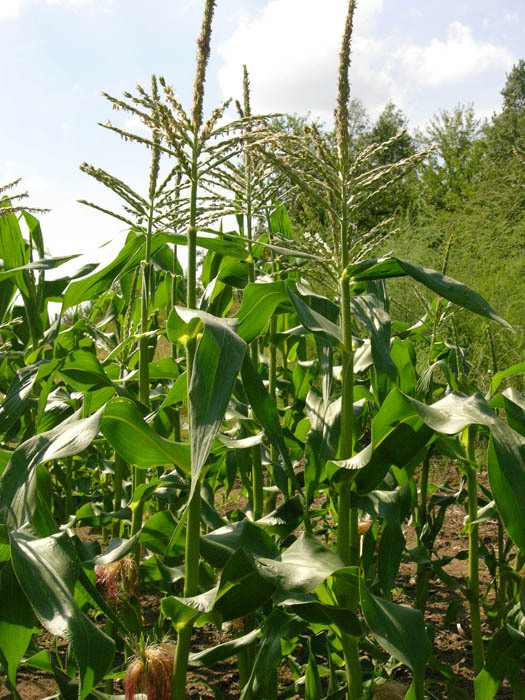 By 1500 BCE maize was spreading throughout the Americas and it became a staple food over the next couple of thousand years. 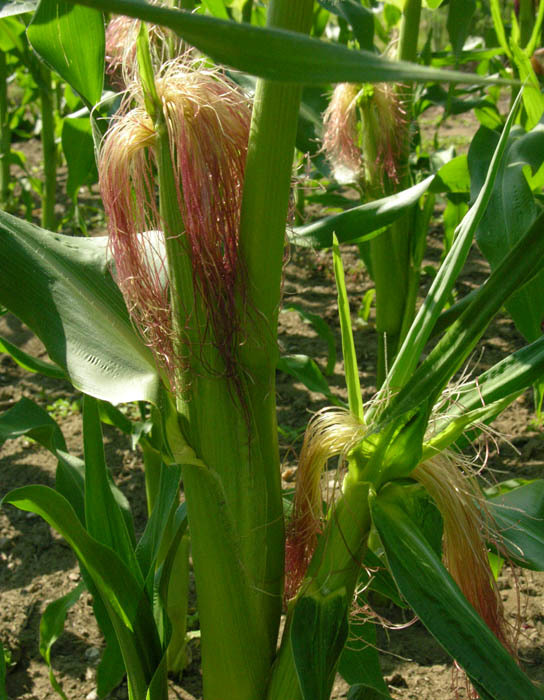 that will drop on the silks coming out of the ears; each silk is pollinated to produce one kernel of corn, so if you open an ear of corn that has blank spots it's because that kernel did not get pollinated. Corn is wind pollinated, so has to be planted in a large block, which doesn't work for many small gardens. 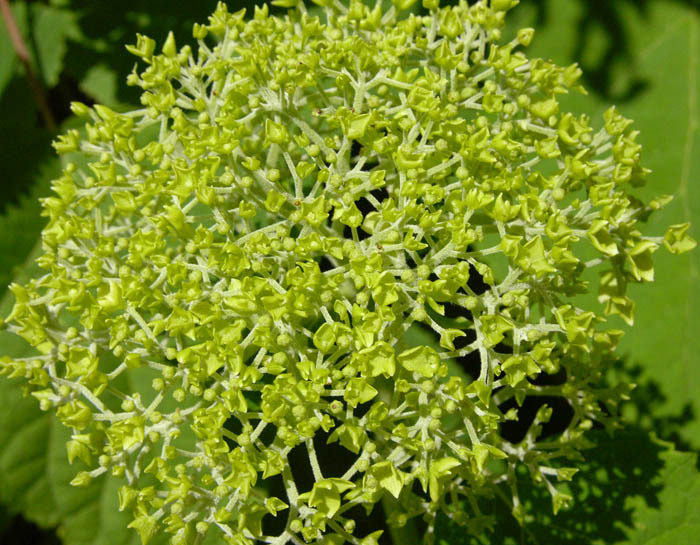 Happily, my garden is large enough for this delicious vegetable, which is one of the great treats of summer, lightly boiled with a touch of butter...oh my! 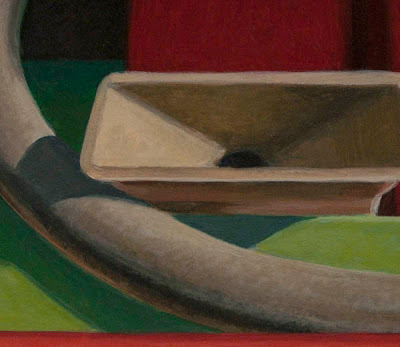 Funnel, egg tempera on calfskin parchment, 5 x 6 3/4 inches. On day 1 I transferred the drawing to the parchment panel and sketched in the color and felt pleased and excited by the image, which has a surreal aspect I like. Day 2 consisted of firming up the drawing and beginning to layer colors to bring them closer to what I was aiming for. I started to feel uncertain about the composition. Day 3 was a mess. I decided that the composition didn't work, so I added the second green horizontal form behind the first. I realized that this made the green space at the left ambiguous, but that didn't seem to matter. What really drove me crazy was dust: the dark red curving forms kept picking up specks of dust which lifted the paint; I tried picking them out, and ended by wiping off the paint altogether, but the dust kept coming back. And the reds were going gray on me and becoming translucent and uneven. I couldn't seem to make a graceful paint stroke to save my life. The painting looked cold and dead and I gave up for the day, not holding out much hope for a better tomorrow. Day 4 saw me just about walk away from this work; the reds were driving me nuts and I couldn't seem to bring the color to life. I did walk away for a couple of hours, feeling I was better off just abandoning the painting. But then I gave it another try by warming the color in the funnel and hose and by beginning to make some headway against the dreaded dust. On Day 5 things finally began to come together. I was able to get a smooth transition of reds in the curved forms without having dust make white specks in them. I mixed a light green and a foreground red that I felt worked better. My brush strokes seemed to have a little more life in them so the painting warmed in feeling. This might not be one of my best works, but I don't have to throw it on the reject pile. 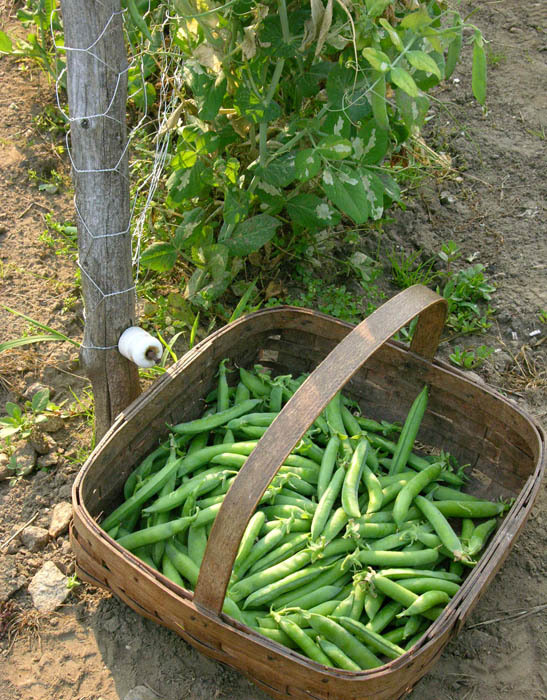 Peas are a delicious vegetable straight from the freezer, tasting almost as good as fresh, so I like to process a lot of peas in season. 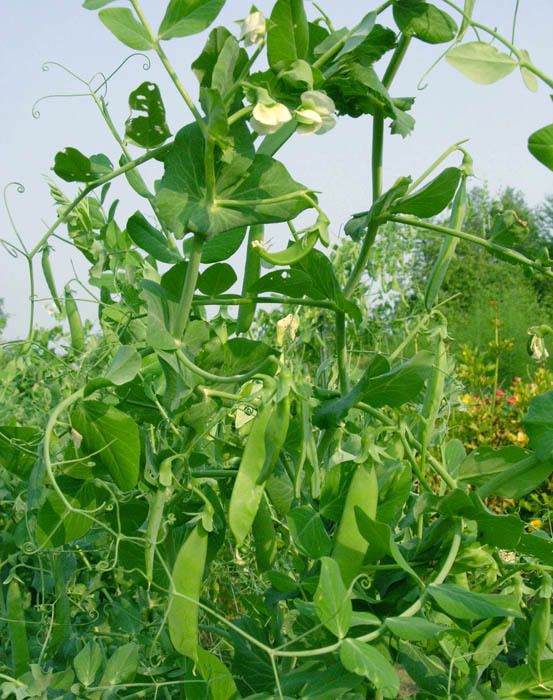 I am in the middle of the pea harvest this week, and spend time every other day searching through 25 feet of dense pea foliage to find the filled-out pods. I walk down the row in one direction, looking back every few feet to get a new perspective, and walk back in the other direction...on both sides of the fence. 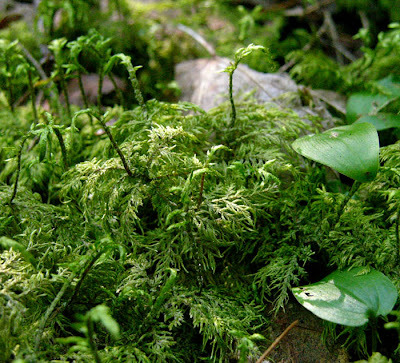 In that way I hope to gather every plump pod. My old reliable garden basket has a good harvest today, not as heavy as that of two days ago, but certainly heavier than it will be in another two days. 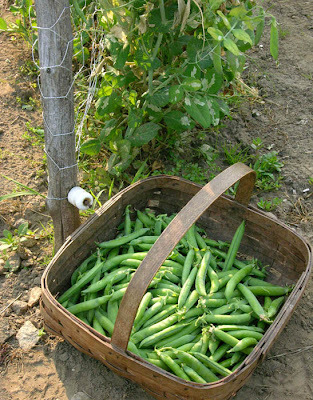 It is very satisfying to feel the weight of the peas as I carry them into the kitchen. 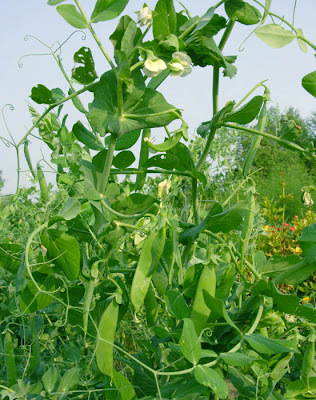 I grow a variety called Green Arrow for its reliably heavy yields (unless a woodchuck gets at the young plants, as one did last year) and long pods filled with a lot of peas. What efficient and clever packaging! 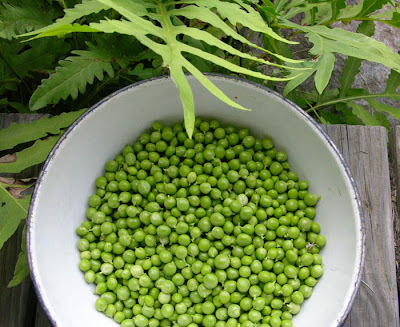 The peas are now ready to be blanched and frozen. I place the blanched peas on a wide metal tray and place them in the freezer; when they are frozen hard, I put them into a large gallon bag. 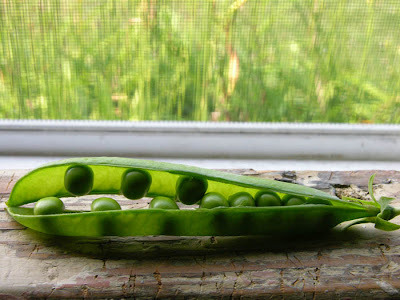 With this method I can take out as many peas as I want as they don't stick together. Growing and processing vegetables is a lot of work, but what a treat it is to able to eat my own home grown, organic food all winter long. 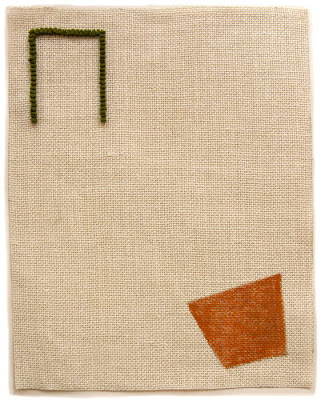 A New Textile: "Objects #4"
Objects #4, hand dyed wool on linen, 9 x 15 inches. 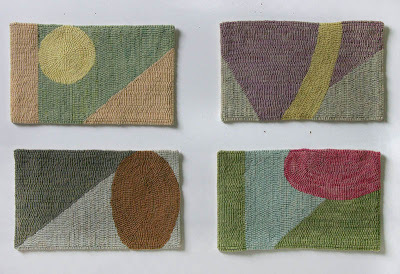 While working on this final piece for the group of four Objects, based on screen shots from the film Objectified, I had to do something that I rarely do: redye some of the wool because the color didn't seem quite right. The plan was always that this piece would be made up of a couple of grays, which already had me wondering if they would work with the other three pieces. I dyed a mid greenish gray, a light blue-gray and an earthy cool red, and I began hooking. I soon felt that the light gray wasn't light enough and didn't have enough blue in it; without more contrast with the darker gray, the work looked a little dead. And, the red was too retiring, too cool. So out came the dye pots again; I redyed a new piece of wool for the light blue-gray, putting a touch of orange in with the blue to gray it; you can see the variations of color in the detail below. I had to dye a new piece of wool because, as with watercolor, you can't make a dyed piece of wool lighter. I was able to overdye the red, though, putting it back in the pot and adding some yellow and orange to warm it, which gave the oval shape more presence. Here is the completed group of four (do we call that a quartet?) hanging on my studio wall. The light gray of #4 picks up the slightly different light gray on the upper right. I think that the newest piece works with the others, certainly with its composition. I hope the color works because it is what it is at this point. One other thing I wonder about is whether I should consider the four pieces as one work, inseparable; I hadn't seen them that way at first. Do you think they should stay together? 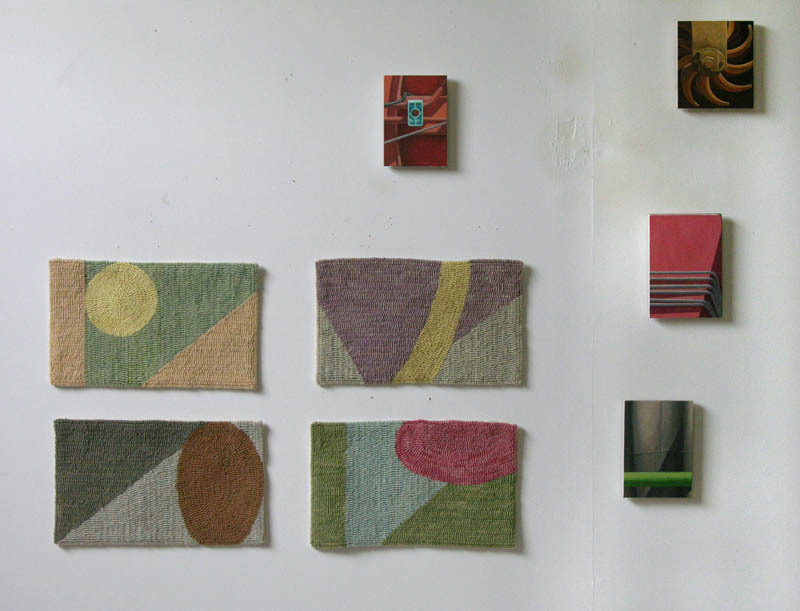 Some recent paintings are hanging with Objects in the studio; the two mediums are so different, yet I hope there's a unifying sensibility at work. Not far from my house, a couple of roads to the east, is a magical little garden full of wit and whimsy. 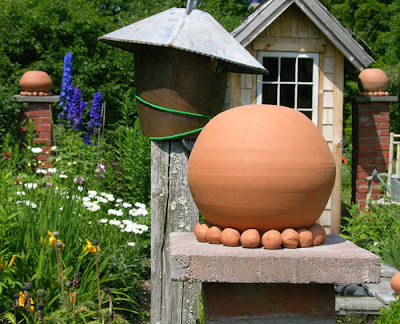 It is the creation of my friend, the artist, ceramicist and small business owner Deborah Jurist. 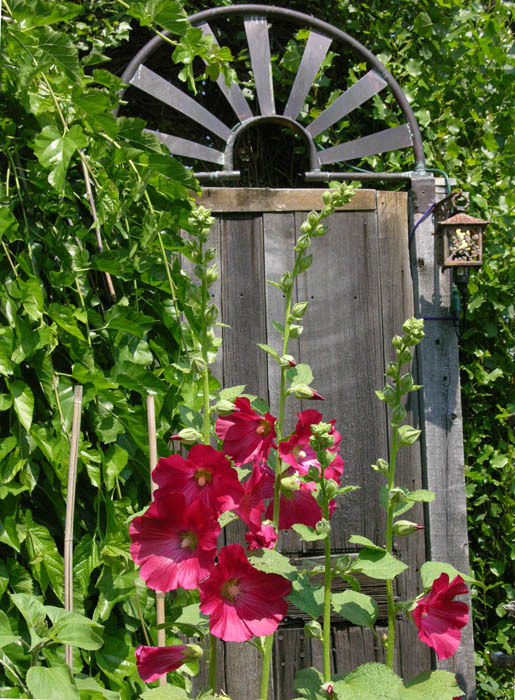 The flowers are lovely of course, but it's the architectural elements – the columns and fencing and shed and pools – that make it so personal and so marvelous. Deborah made the humorously bulbous ceramic finials, which were inspired by fence posts at the University of Pennsylvania library. 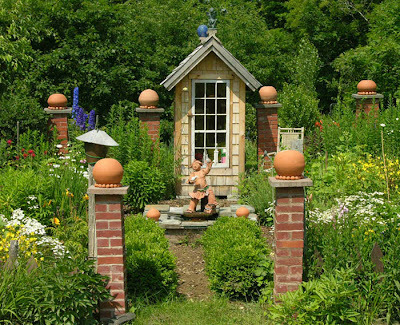 I love the repetition of all those warm round forms atop the brick columns and amid the profusion of plants. The metal light, its hat askew, or is it tipping toward its friend?, is a fitting companion for the large ball. 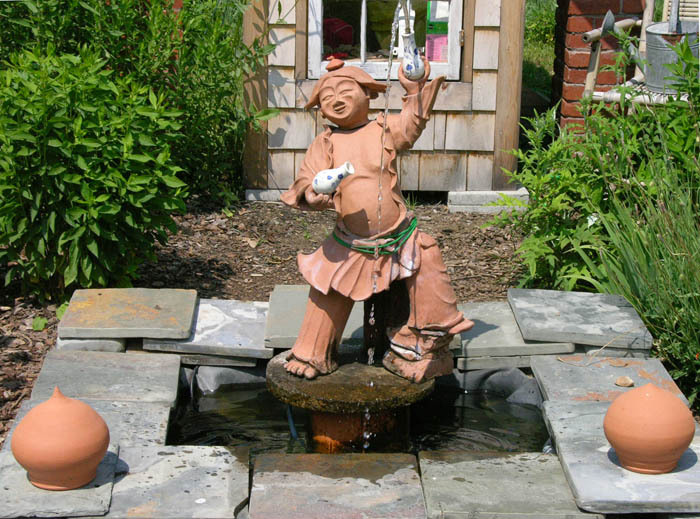 The fountain figure, made by Deborah, is Nanki-Poo from the Mikado, a surprising character to live in northern Vermont, but so at home in this garden. 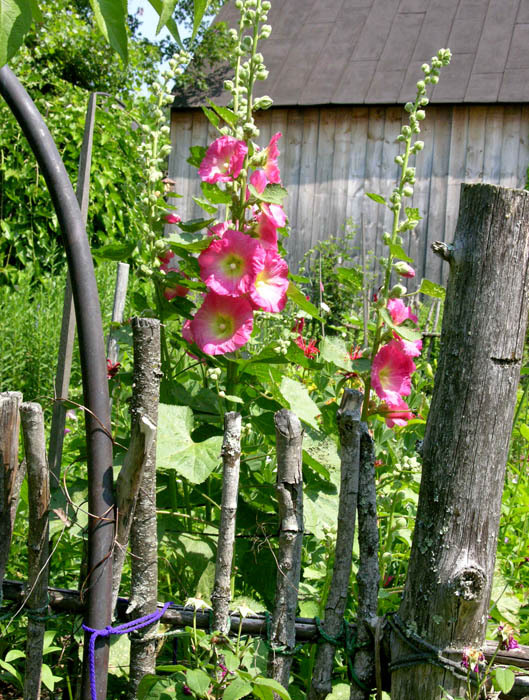 The fence surrounding the small garden plot is made up of branches and tree trunks, all in their natural irregular shapes and textures. 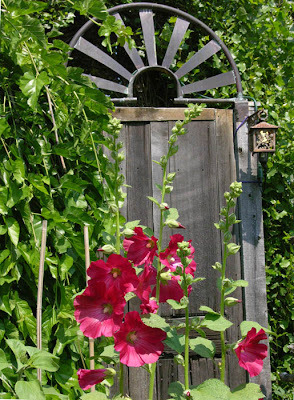 The old fashioned hollyhocks look perfect in this setting. This "door to nowhere" as Deborah calls it, had been a back door of the house. Deborah wrote about it: "I never expected the delightful feeling of arriving in a different place just by opening and closing a door." There are many charming details, such as the rock-hatted birdhouse and the old metal letterbox. Alongside the enclosed garden, to its north, is a rock-surrounded pool with a small flowery island at its center, punctuated by a putto birdbath. 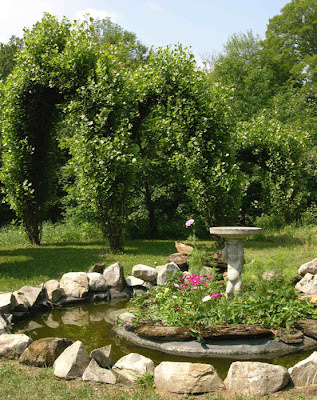 And you can see in the distance an allée beginning behind the enclosed garden and made up of Lombardy poplars; it is an element that is generally so formal, but in this garden simply emphasizes its wondrous nature. 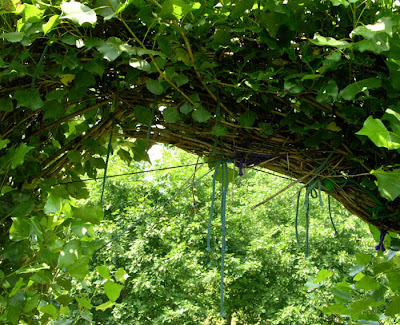 The poplars are just bent and tied together with string...amazing! 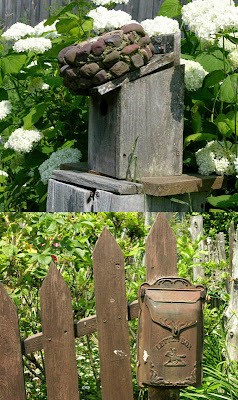 Across the road, nestled between the walls of the 18th century house is a tiny garden behind another type of homemade fence, centered by a birdbath and with a profusion of foliage and bloom. 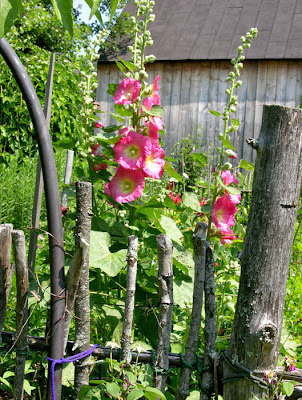 I've named this the "hidden garden" since it seems a little shy. There is always more to discover here, and always more to delight. to the barely opening florets, bright green at the ends of the paler green stems. 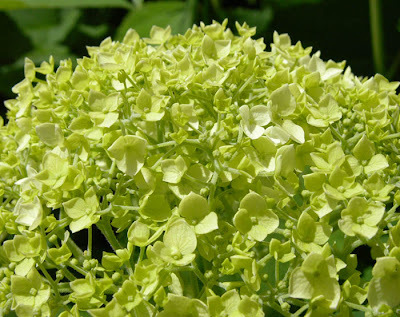 The petals open a pale cool green and begin to form a large, grand flower head. And the green pales to white as the petals spread and the flowers now dominate the greens of the leaves. 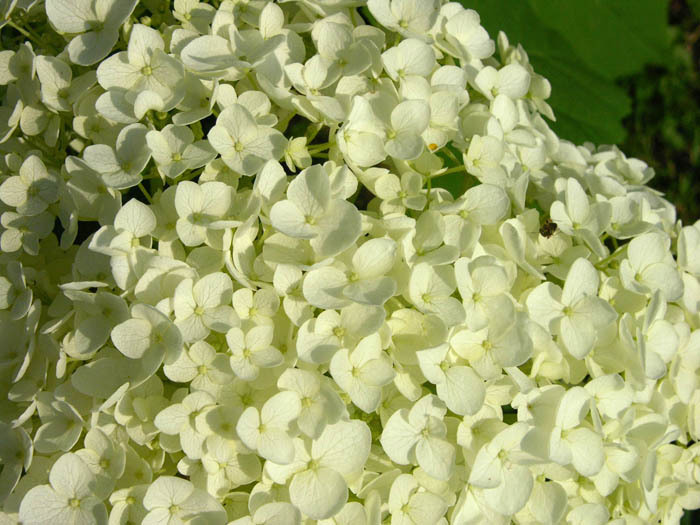 Later in the summer, the flowers will again take on a greenish cast and it is at that point that I can gather bunches for drying, keeping summer alive throughout the winter. Untitled, 1970, oil on canvas, 16 x 20 inches. 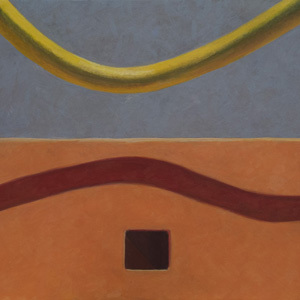 Untitled, 1970, oil on canvas, 40 x 35 inches. A couple of weeks ago I got an email from my artist friend (rappel) – whose work you can see here – telling me this story: she had run into someone she knew from art school who reminded (rappel) that 40 years ago she was working similarly to her current practice, cutting up drawings and recombining them; this was a real surprise to her. This got me thinking again about whether we have an innate sensibility or style that underlies our art making. A few years ago, when preparing for a slide lecture, I had some of my very early painting slides scanned; I painted these works in 1970 during my first year of graduate school; I had forgotten about them until then because they didn't fit in to my narrative at the time. (rappel's) anecdote brought them back to my mind because I can see a relationship between these stylized still lives and my current body of work, leapfrogging over 40 years. When I was in school, my teacher Philip Pearlstein told me that I had an "architectonic sensibility" and I believe he was correct. 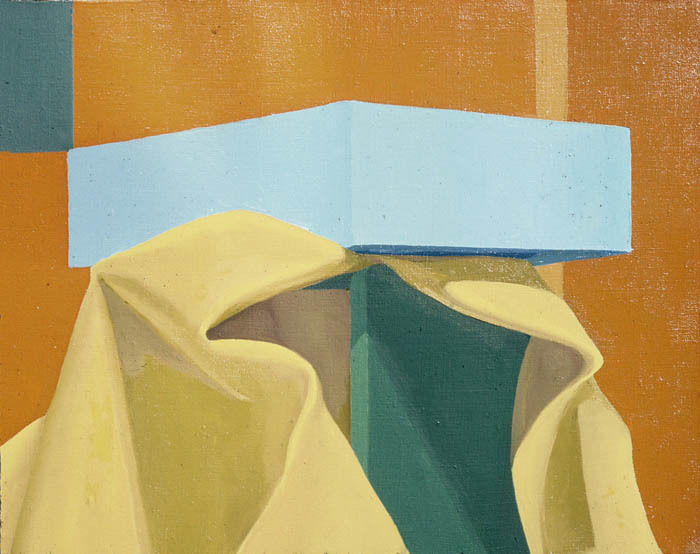 I also have a desire for precise form and crisp edges and this seems evident from the very beginning. I've only made a couple of very brief forays into painterly painting, soon abandoned. 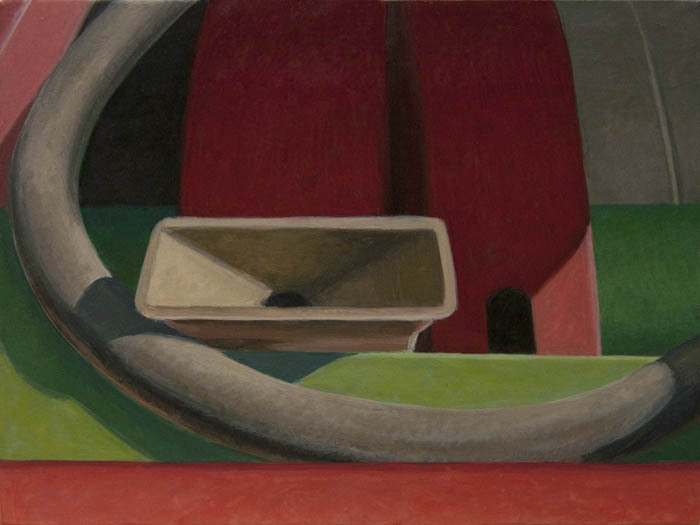 Chinese Maple, Catskill, NY, 1981, oil on canvas, 14 x 28 inches. My first exhibitions in a commercial gallery consisted primarily of "portraits" of Victorian domestic architecture. These paintings were literally architectonic; I loved the clear horizontals and verticals and the complicating of large masses by fine detail. 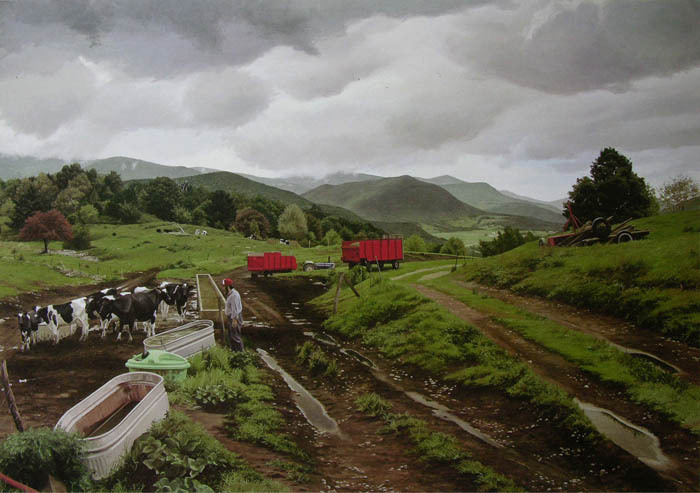 After Rain, Pawlet, Vermont, 1988, oil on canvas, 50 x 72 inches. I gradually included landscape surrounding the architecture of houses and barns, and even here in an almost pure landscape, I think my structural concerns are still evident, with diagonals crisscrossing the space. And of course there is always the sense of the real, the tactile, that has excited me during my entire painting life. 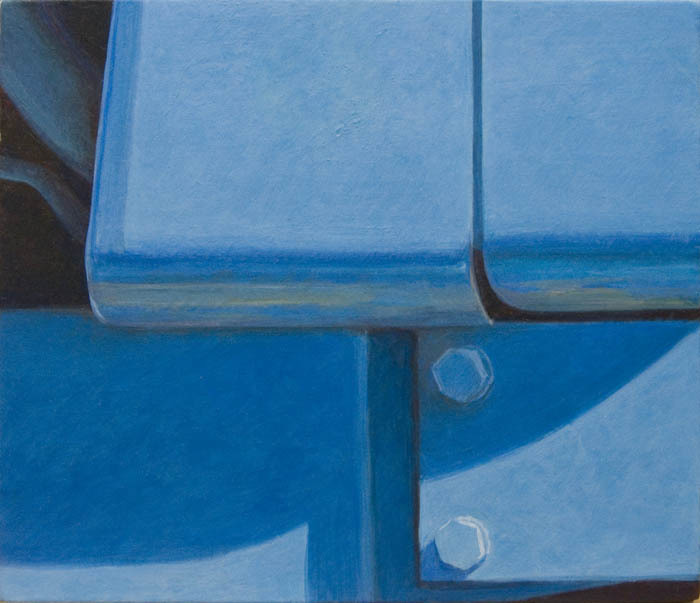 Blue Bolts, 2011, egg tempera on calfskin parchment, 4 7/8 x 5 1/2 inches. 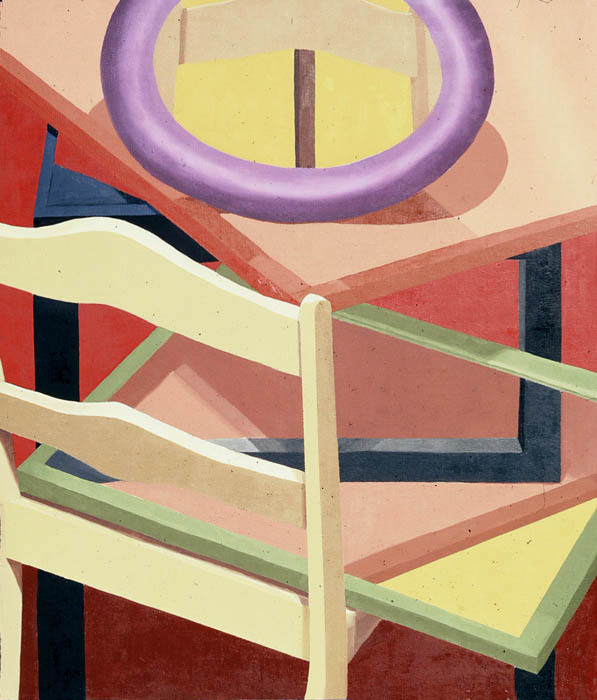 After over 30 years of painting architecture and landscape and machinery in the landscape, I feel that I have come back to the simplified near-abstraction of still life, very different but in some ways closely related to those student paintings done so long ago. 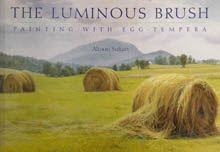 I wonder if other artists have had a similar trajectory; do you see yourself as having an inherent style? or has your work changed greatly over the years? 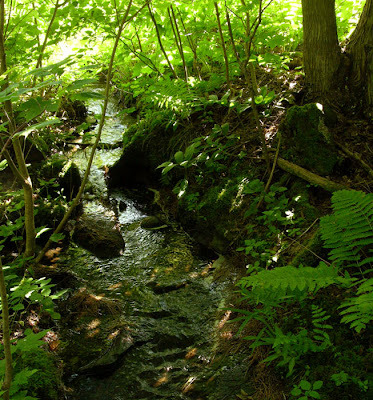 Last week I had the great opportunity to take a walk through Susan Sawyer's woods, a 30 mile drive from my house. 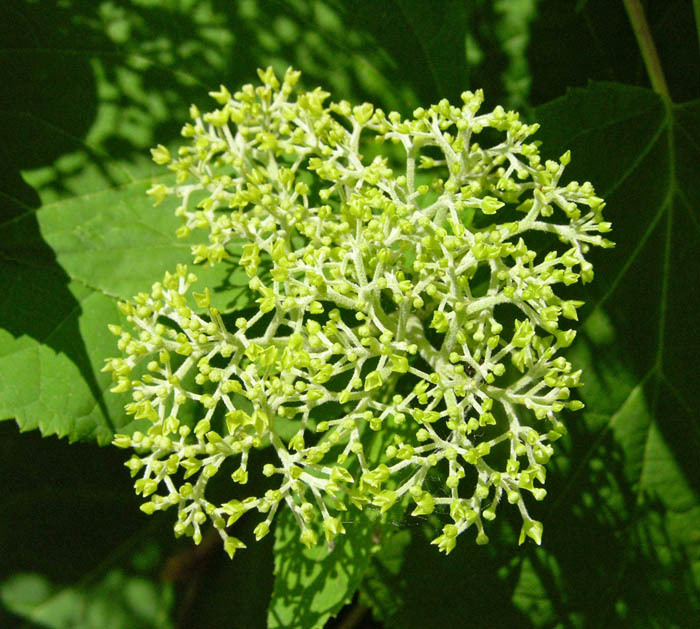 Susan is a long time reader and commenter on this blog, a naturalist who has often identified plant species for us. She is on the staff of the Four Winds Nature Institute, a terrific organization that brings knowledge of the natural world to Vermont communities. It was such a treat for me to walk through a beautiful new woodland environment – and it's surprising how different it can be such a short distance away – and have Susan name mosses and plants and mollusks. I love the small world of mosses, their varied forms looking like miniature forests. I don't believe I've seen this little gem on my walks at home, with the thin-leafed "fronds" rising from a center. An aptly named moss, which sends its layers of growth upwards, step by step. 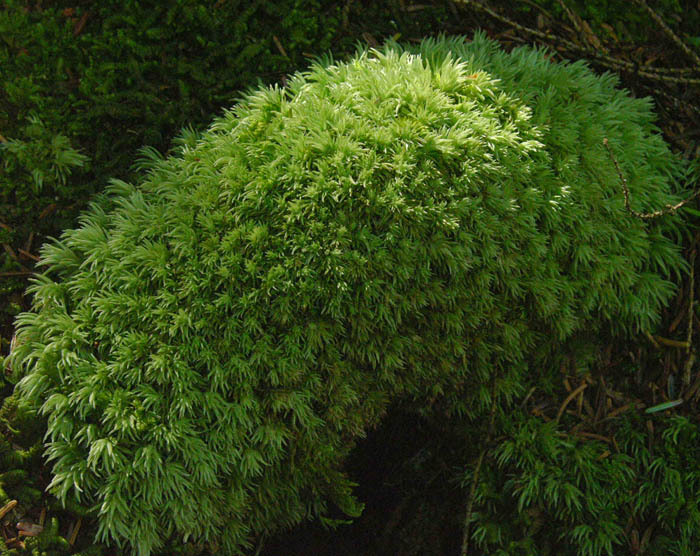 The soft round forms of Pin Cushion moss invite a hand to caress them. 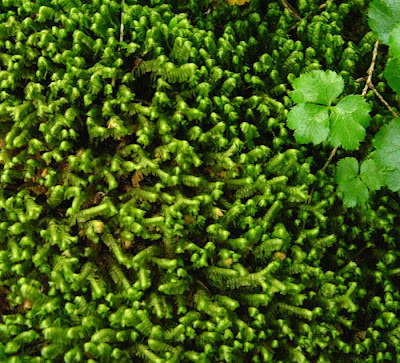 I would have assumed that this was another moss, growing in separate rising textured green stalks, but it is in another family, the liverworts. 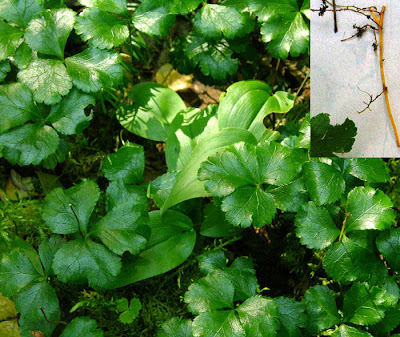 Goldthread is a very pretty little plant with glossy three-part leaves that carpets the ground. Susan pulled up a bit of root to show me how it got its name. 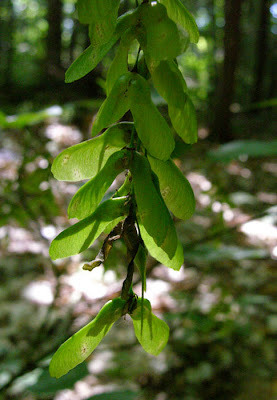 I have sometimes noticed some large leaves growing on waist high stems in my woods, but never knew what they were. 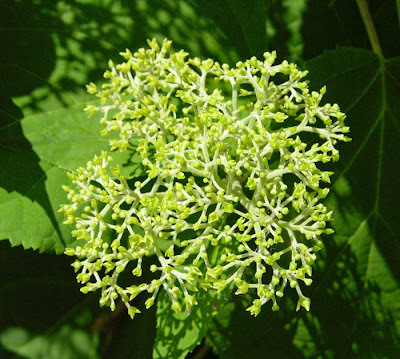 It turns out that they are a type of maple, Striped Maple, named for the bark striped in black and dark green. It doesn't grow very tall, and in my woods hardly at all, because it's a favorite food of deer. I love the way the seedpods of this small tree dangle in a long line as though they were strung together for holiday decorations. I love Indian Pipe and was aware of it before last week; it is so strange to see the startling white of its stem and nodding flower in the midst of the rich darks of the woods. 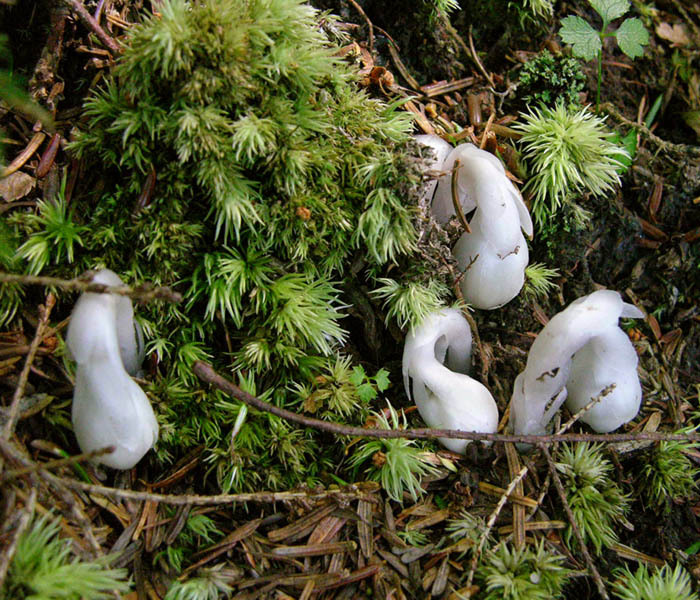 In this photo they are just emerging, unfolding from a curled posture, looking like vulnerable new life or fetuses in the early stages of growth; they catch at my heart. 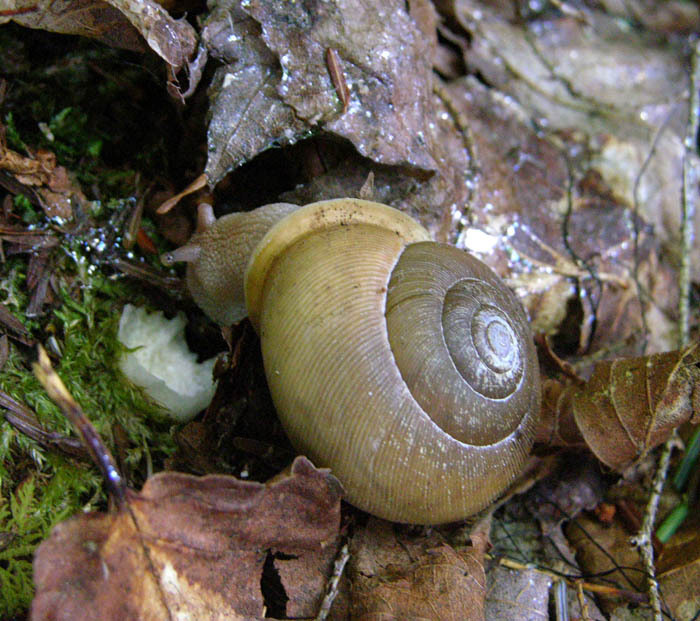 Moving into the animal kingdom, here is a charming little snail, with lightly etched lines curving from the main spiral of the shell. It has found a tasty morsel to feed on. 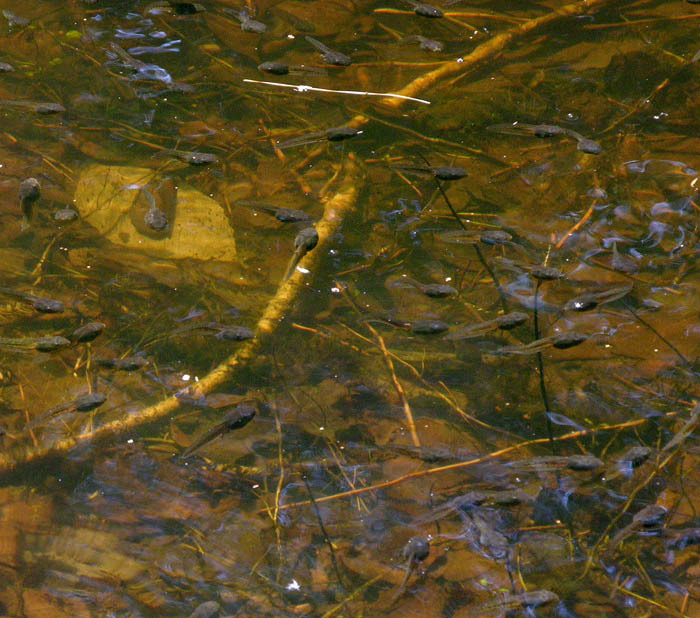 Because of the very wet spring, there are still large vernal pools in these woods (swarms of mosquitoes too) and this one was populated by hundreds of tadpoles of the spring croaking Wood Frog. Ordinarily, they would be much further along in their development than they are here, with only some showing their new tiny legs. 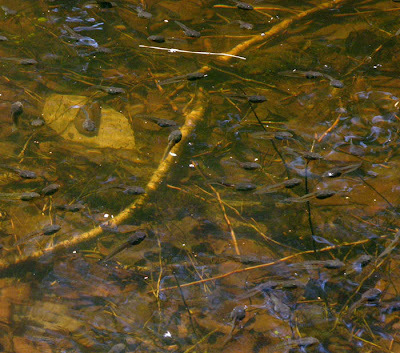 Susan explained that they are able to gauge their environment; because the pool is so slow in drying up, they are taking their time to mature. 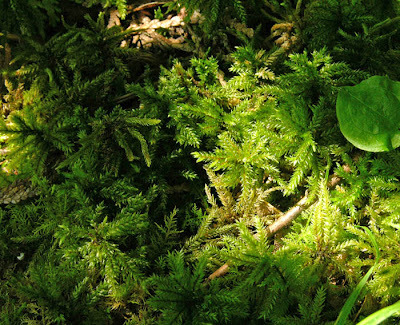 I find that completely amazing, one of the marvels of adaptable life. A New Painting: "Blue Clamp"
A New Textile: "Objects #3"